Facebook page 'Three Shalits' removed after posting photos of children celebrating kidnapping with three finger hand gesture. 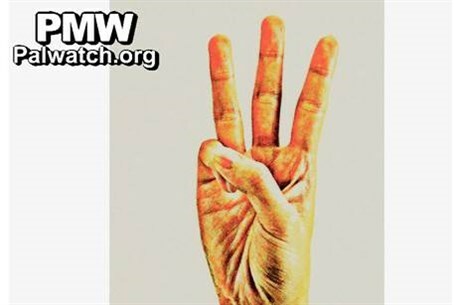 A Facebook group called in Arabic "Three Shalits," a reference to Gilad Shalit, has been removed after posting pictures of impressionable young Arab children making a hand gesture extending three fingers - in celebration of the kidnapping of three Israeli teenagers last week. Despite the page being removed, examples of the pictures can still be seen at the page of blogger "Israellycool," who first reported the phenomenon. The blogger noted his opposition to removing the Facebook page, saying "if people are speaking hatefully we need to take note of it, not pretend it isn’t happening by putting our fingers in our ears and singing la-la-la." The hand gesture was seen on the official Facebook page of Palestinian Authority (PA) Chairman Mahmoud Abbas's Fatah movement on Sunday; below a photo of a hand making the three-finger gesture was the text, "For your interpretation :)". The photographic celebration is just the latest in a series of moves celebrating the kidnapping of Eyal Yifrah, 19, Gilad Sha'ar, 16, and Naftali Frenkel, 16, last Thursday by Judea and Samaria-based Hamas terrorists. Arab residents of the Hamas-stronghold of Gaza celebrated on Saturday by handing out candies. The official PA daily on Sunday printed a cartoon, distorting the World Cup 2014 logo to show three people held captive, with the word "Khalil" written below - Arabic for Hevron, where a cell phone signal of one of the teens was picked up from. Fatah also posted on its Facebook page on Sunday a cartoon of three rats with Stars of David dangling from a fishing rod, accompanied by an Arabic caption in red reading "A Master Stroke"; its implications are unmistakable.